What is your soul saying to you these days? Do you know how to hear and listen to it? This workshop is designed to help you slow down so you can wake up and listen. Break from busy. Breathe deep. Give yourself some time and space to listen to your soul. Come learn and experience the benefits of Christian contemplative practice in a small, supportive setting. If you are looking for a soul-full experience in God that’s personal and particular, yet mysterious all at the same time, you’re invited to join a small group (max 12) to learn about and practice along the contemplative path. Absolute “beginners” are welcome, and also those who enjoy practicing with others. Christianity has a rich heritage of contemplative practices that support people’s connection to God. And, while much of these have been “lost” over the centuries, there is a growing interest and recognition of their profound support for our spiritual journey. We’ll be practicing pathways like Lectio, Audio & Visio Divina, variations of the Examen, Breath Prayer, Centering Prayer, and more. 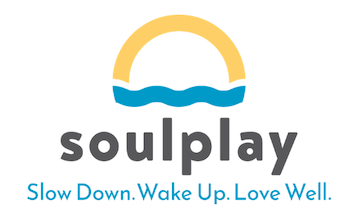 Go ahead… let a little play into your soul! Join with others in a unique book club experience. We’ll dive into this New York Time’s Bestseller and discover just how important this book is for our time. An Altar in the World by Barbara Brown Taylor is a beautifully written book that helps us tune into meaningful ways to discover the sacred in the small things we do and see, from simple practices such as walking, working, and prayer. Through Taylor’s expert guidance and thought-provoking prose, we will learn to live with purpose, pay attention, slow down, and practice reverence. Paul Swanson - Program Designer at Richard Rohr’s Center for Action & Contemplation, and host of the podcast Contemplify and Another Name for Everything. What a great way to bring some presence and attention this spring! This experience is SOLD OUT. Check out a similar walking retreat expereince: The Side Road Saunter. The Elora-Catarct Trail is a 50km trail located in one of the prettiest areas of southwestern Ontario. The trail rolls through forest and farm-land and is a perfect place to slow down so you can wake up to what your soul is saying to you. The terrain is flat and perfect for most pilgrims. Group size 5-7 people. Perfect for couples or a weekend get-away with friends. We will be walking some of the time together, and some of the time on our own. If you are someone who loves to marry adventure with intentional soul work, this trip will deliver. Women and men of all ages (18 and older), who are able to walk an average of 25km/ day, want to experience the comradery of staying in pilgrim hostels, and enjoy being in the company of a small group of six people, should consider applying for this soul-full pilgrimage. Are you looking for an afternoon to reset after the summer and refresh for the fall season ahead? Take time to listen to your soul while walking in peace. Enjoy this half day guided, mindful walking experience in the rural, pastoral landscape of southwestern Ontario, just outside of Elora, Ontario - “Ontario’s most beautiful village”. Give yourself the gift of slowing down, so you can wake up and experience more calm, clarity and confidence for the season ahead. We’ll spend the afternoon in all the glorious autumn-splendor at Crieff Hills Retreat just south of Guelph. Christianity has a rich heritage of contemplative practice that support people’s connection to God. And, while much of these have been “lost” over the centuries, there is a growing interest and recognition of their profound support for our spiritual journey. the reasons why this rich well of resources has been largely lost, and why there is a growing interest and resonance. Participants will walk away with a deeper appreciation for the roots of Christian contemplative practice and an experience that will support your connection to God. How will the upcoming Christmas season be different if you took a few hours to “be” instead of “do”? The swift speed in which life moves these days can be dizzying. Screen-time, jam-packed schedules, and the onslaught of information is making us sick. Going on a silent retreat, even if just for a few hours, allows you to calibrate the rhythms of your life as you get in touch with your body, heart, mind, and soul. Grow towards being a more rooted and centered version of yourself this season and discover the gifts to be found in the season of Advent. Save the Date: more information to come. This year’s retreat SOLD OUT! Save the date and stay tuned for details about next year’s retreat. These small intimate classes are geared for the beginner and the novice wanting to improve their yoga practice, (however, modifications will be given to address multiple skill levels in class). Focus on proper alignment, breath work, deep stretching and strength challenges will have you leaving class feeling stronger and refreshed. Each class will include a bit of inspiration and reflection to help bring meaning to the Christian season of Lent. Don’t know what “Lent” really is? No problem. Any person, of any faith background (or not), can attend and enjoy a thoughtful, safe, soul-filled yoga class that will incorporate occasional quotes, and images found in the Christian scriptures. A soul-full weekend with Enneagram teacher Chris Heuertz, and Contemplative Guide Phileena Heuertz.